When I discovered Mem’s Fruit Truck last spring, it was love at first bite. My tastebuds had been depressed since my office moved from Food Heaven (aka Downtown Salt Lake City) to the fast food-laden industrial office park in North Salt Lake where souls go to die. No more lunch time sushi or leisurely afternoons spent at Indian food buffets for this lady. No Food Truck Thursdays at Gallivan, or fancy lunches twirling creamy Pasta Carbonara on my fork at Copper Onion. My foodie future looked bleak. Mem’s Fruit Truck was a shiny, fruity symbol of hope, representing all the food I had yet to discover. The first time I spotted the fruit truck, an unknown force took over my steering wheel and turned into the parking lot of Lucero’s Tires (and their adorably named side business, Lucero’s Pretty Worms) on 1039 S. Redwood Road where Mem’s Fruit Truck had set up business. As I walked up to the red truck, I noticed two windows full of colorful fresh fruit, coconuts and cucumbers cut into large chunks, Mexican candy and a variety of chips. I watched with fascination as the customer before me left with a huge clear bag of assorted fruit. I pointed to that bag, smiled and nodded. “I’ll take that please!” I chirped as I handed over my cash. “With chili and lime?” the cheerful man behind the window asked. “Absolutely!” I said enthusiastically. My tastebuds were excited. 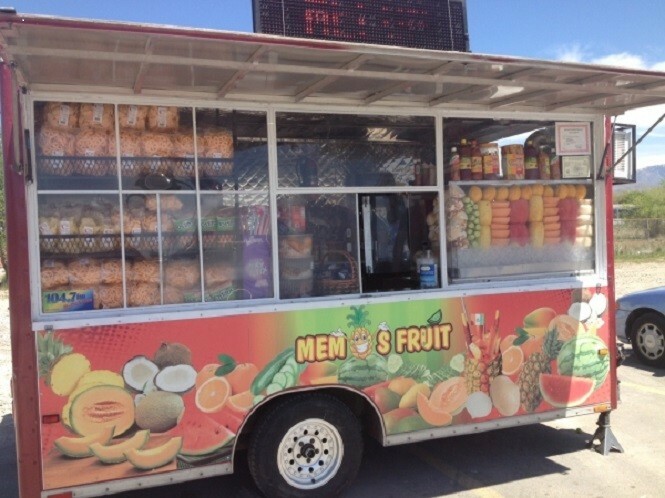 A little internet research led me to the conclusion that fruit trucks are everywhere in LA. It was only a matter of time until the Mexican food trucks selling fresh fruit popped up in Salt Lake. North Salt Lake was a likely first spot, with a booming Latino population and a plethora of taco trucks and Hispanic restaurants. At first I felt silly that I was so over-the-top about something so ordinary, but you know what? This food was new to me, and I was going to enjoy every minute of exploring it. The dish I fell in love with (that I dubbed “Fruit Bag” last year before knowing the proper name) was Coctel De Fruto. 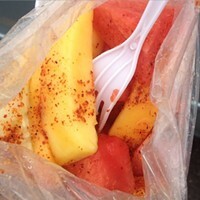 For a reasonable $6.00 for a medium and $10.00 for a large, you can enjoy a medley of chopped watermelon, cucumber, jicama, mango, pineapple and slivers of coconut doused with lime juice and a heavy-handed sprinkle of chili. The unique sweet, tart and spicy taste brought me back to the little truck at least three times a week. I was thrilled to see Mem’s Fruit Truck back in business last week. The new year brought the addition of a proper menu with colorful pictures of new dishes to try. My mouth watered with the possibilities. The first new thing I tried was totally out of my comfort zone. I asked for the Tostilocos. From the sign I could tell something was served over tortilla chips, and was served in the chip bag. I was intrigued. The nice lady behind the counter said, “You like pork rinds? !” as she showed me the huge jar of pickled white strips. “Uhh, sure!” I said. (I was not sure.) 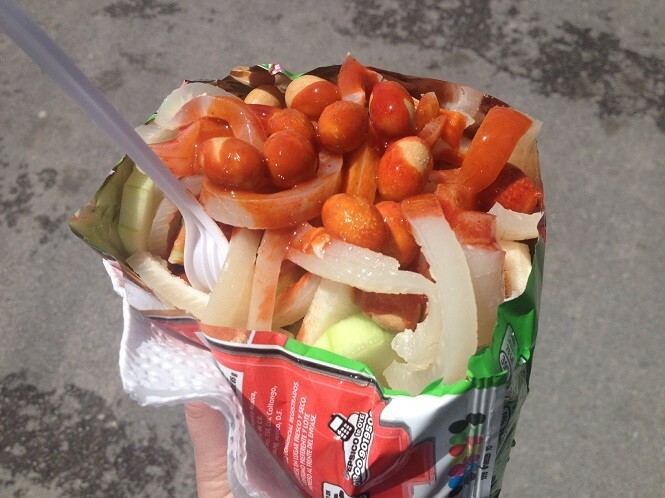 She handed over the bag of tortilla chips topped with rubbery, pickled pork skins, cucumbers and jicama drenched in a layer of hot sauce and topped with crunchy peanuts. I couldn’t get past the chewy, slippery pork rinds. As I nibbled on the cucumbers and jicama covered in hot sauce, I studied the picture I took of the menu. There are still interesting things to try and I have a glorious summer of work lunches to spend at Mem’s Fruit Truck discovering a new-to-me cuisine.